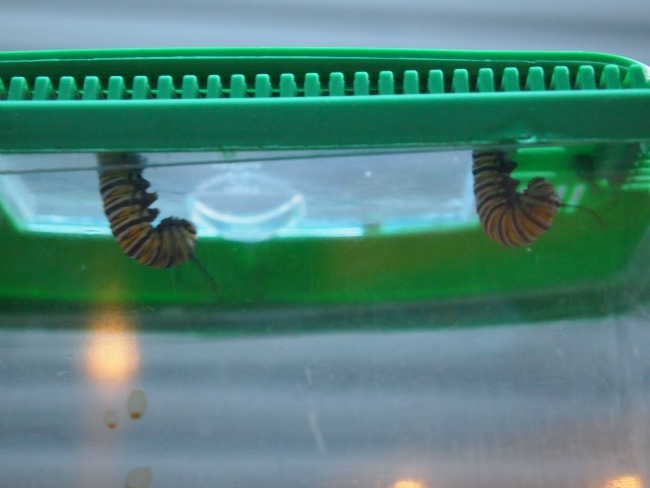 This year we had an awesome opportunity to watch the monarch caterpillar life cycle, when my sister found some eggs and caterpillars on the milkweed plants in her back yard and offered to let us have a few. We got to watch each stage a number of times over, so we didn’t miss a thing. I thought I’d share a few pictures of our magical experience, just for fun! 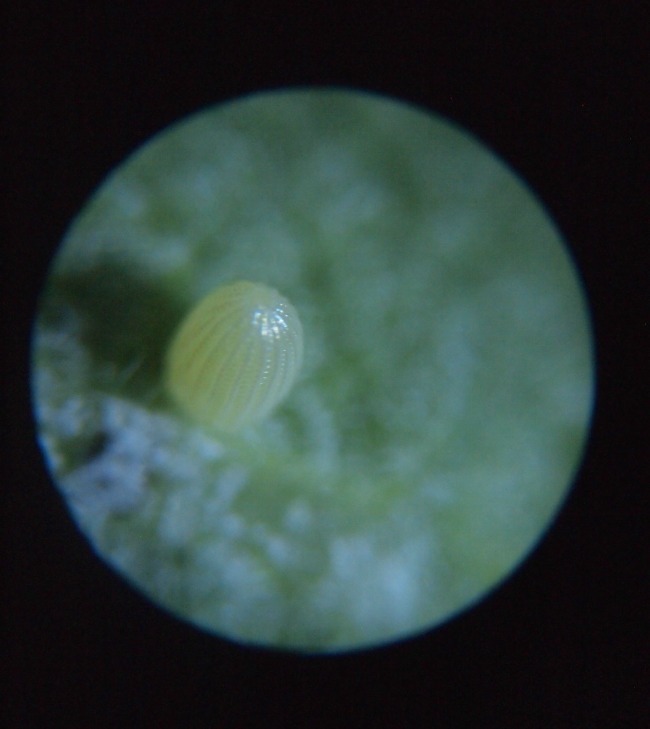 After a few days, the egg turned dark, and under the microscope I was amazed that I could see the unborn caterpillar squirming around inside the transparent shell! A darkened egg is a sign that it’s about to hatch. 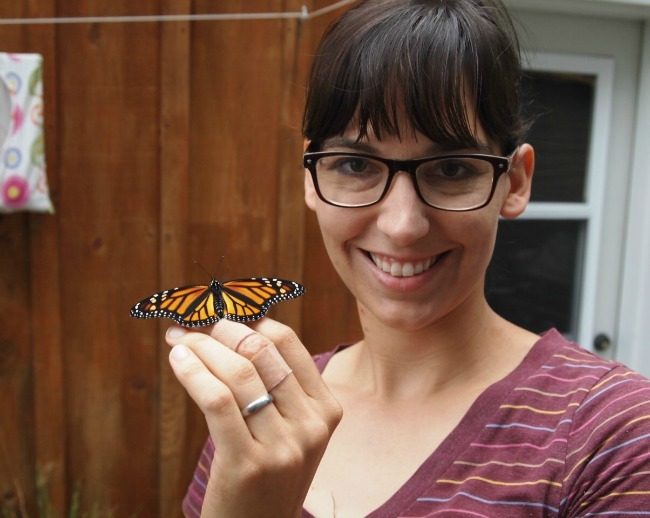 Whenever I was out in the car, I was constantly pulling over to pick fresh milkweed from the ditches to feed my hungry brood of caterpillars. 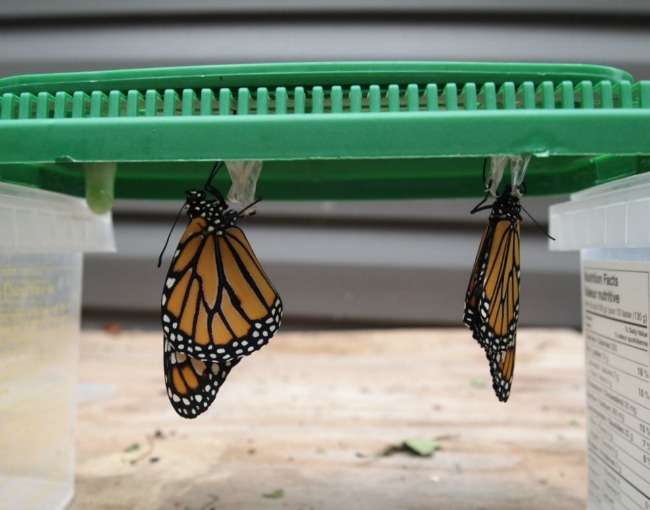 As they grow, monarch caterpillars shed their skins four times during this stage. I never got to witness the molting, but I did see a caterpillar shortly after it lost its skin. 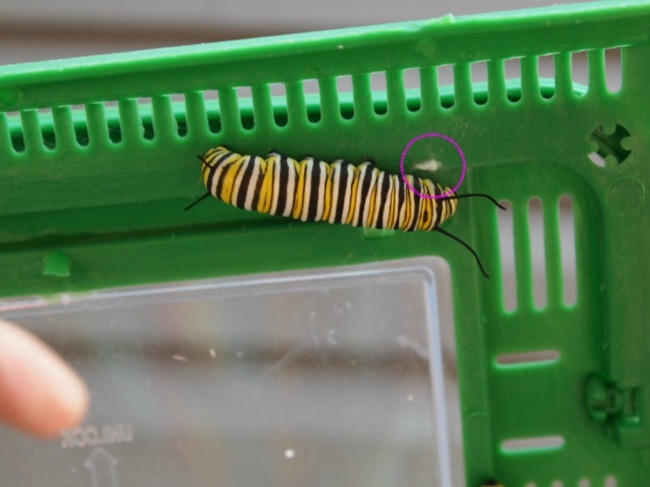 We could tell a caterpillar was getting ready to pupate when it started to spend a lot of time on the lid of its home. It was looking for a place to make its chrysalis! We knew the deal was sealed when it started to make a silk button to hang from (seen below, circled). Then it would attach its rear end to the button and hang upside down in a J-shape. It would hang like this for over 12 hours, hardly moving. 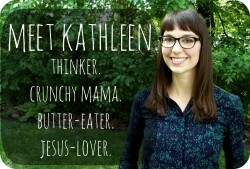 Beneath the skin, crazy changes were happening. 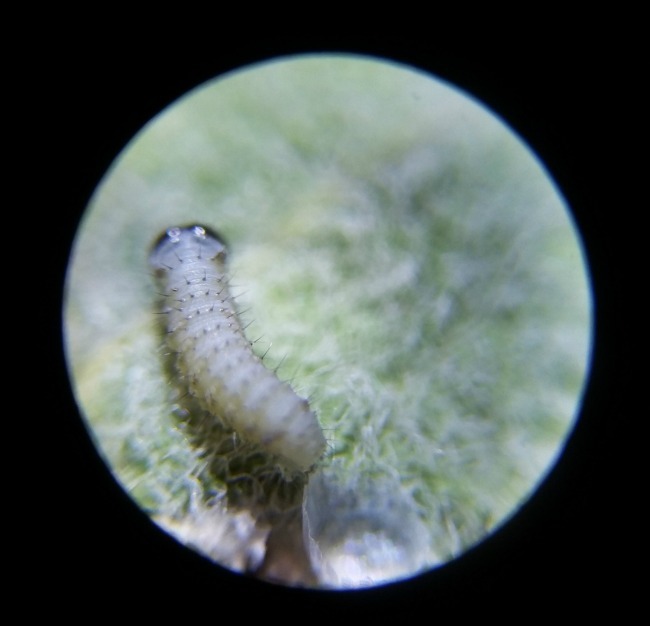 When the hanging caterpillar started to get a bit more active, we knew the transformation was close at hand. 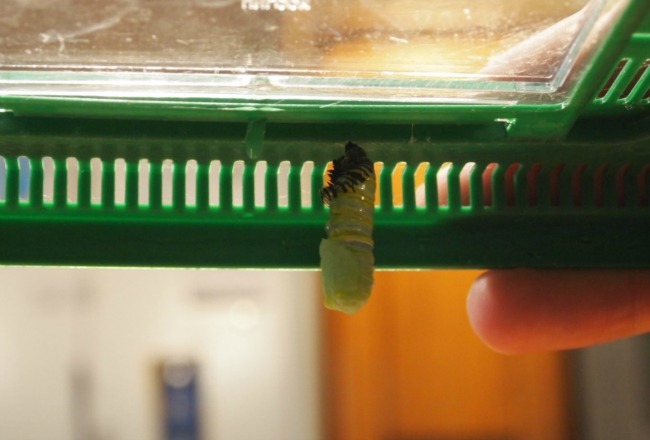 The actual change to a chrysalis takes less than two minutes after the skin first splits, so you have to watch long and carefully if you want to catch it. I started to notice that the skin begins to pulsate just before that happened. I got to witness this magical event three times, with lots of obsessive watching. 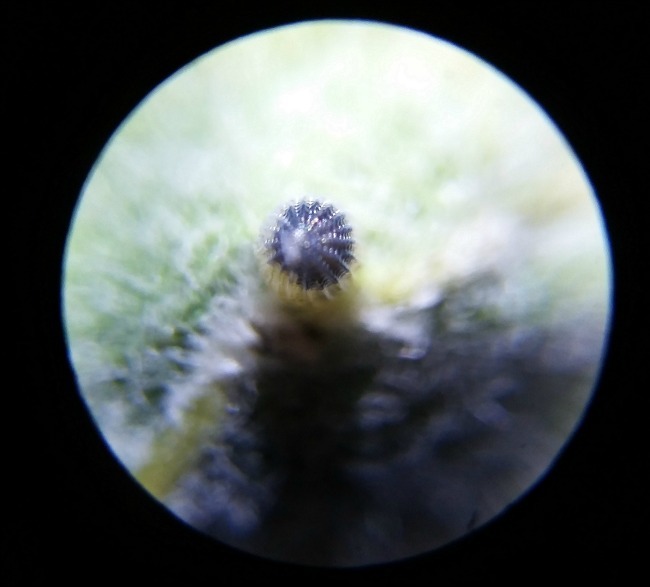 The skin cracks along the back, and the caterpillar “unzips” its skin by doing its “pupa dance,” revealing the wet green chrysalis underneath. It dries and hardens over the next hour or so. By the next day, it looks like a magical jewel. It’s hard to believe there’s something alive in what looks like a hanging jade stone. 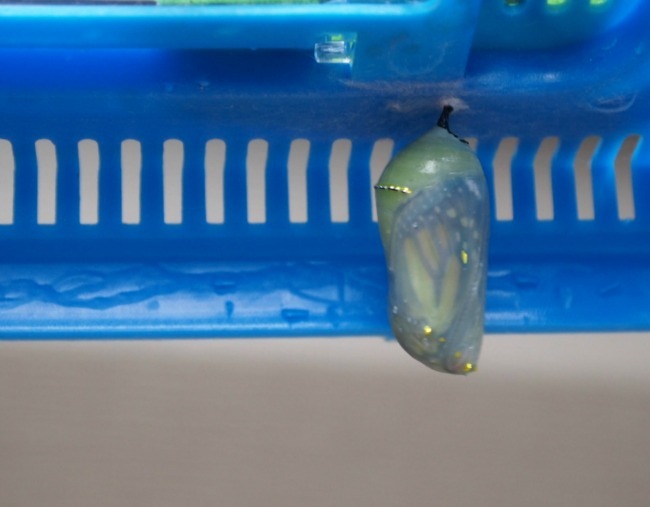 Then all of a sudden, after about 10 days, it starts to darken, and by nighttime the chrysalis is transparent, revealing the wing patterns inside. 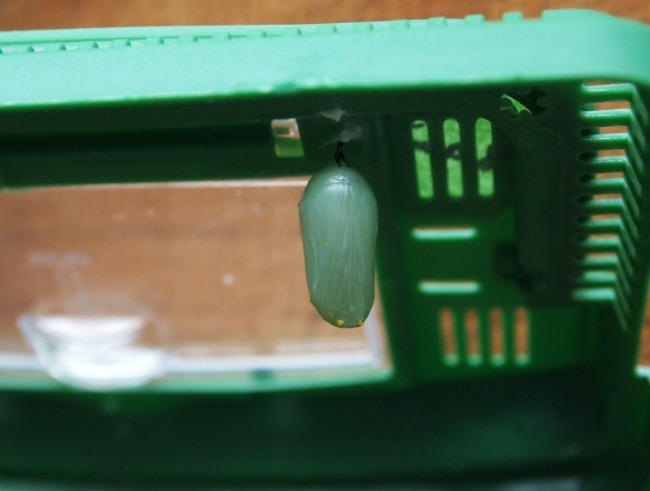 The next morning, the butterfly emerges! It starts with damp, crumpled, wings, that quickly dry and flatten out. 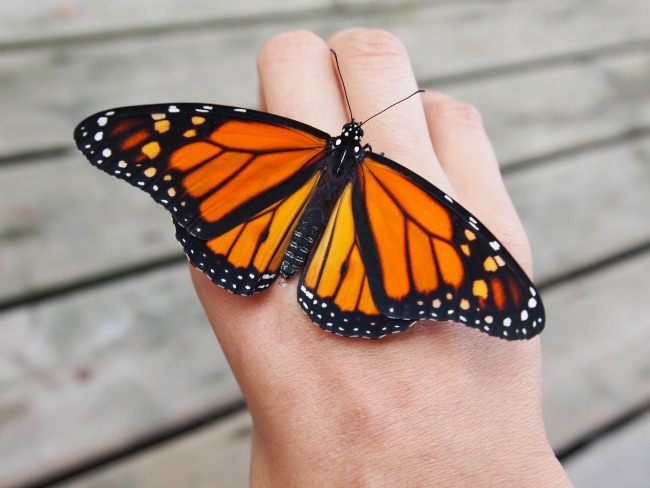 After about two hours –when it starts pumping its wings — it’s ready to climb onto your hand. This was my favourite part. 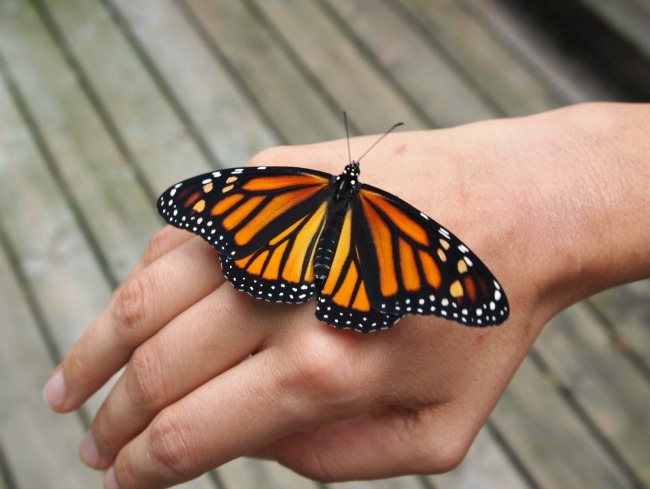 It felt incredible to have this delicate little insect walk along my hand. 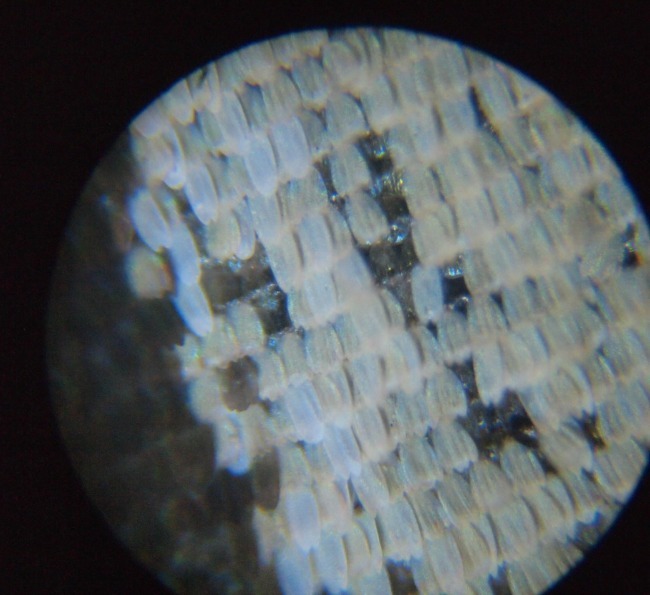 We learned that you can quite easily distinguish between the sexes by looking at the wing patterns. 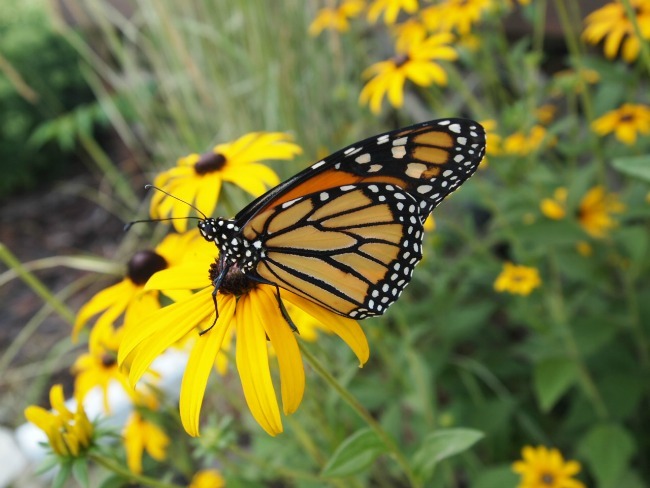 After I had fully appreciated the butterfly’s beauty, I let it walk onto a flower (they feed off of nectar). One morning we found a dead monarch butterfly in our yard that had been killed by a predator. 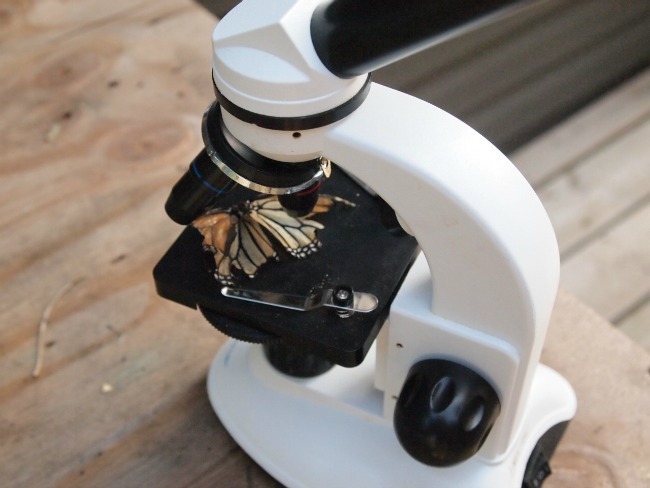 We took the opportunity to look at its wings under a microscope (we have this one). 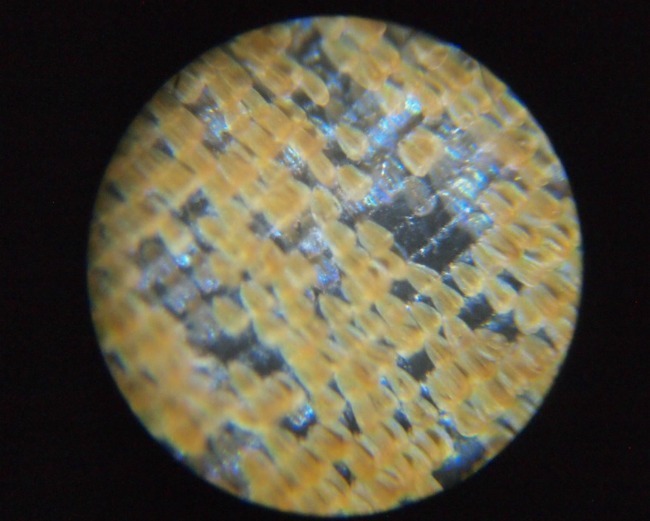 It was so interesting to see the scales. There you have it! I highly recommend it as a wonderful learning experience! 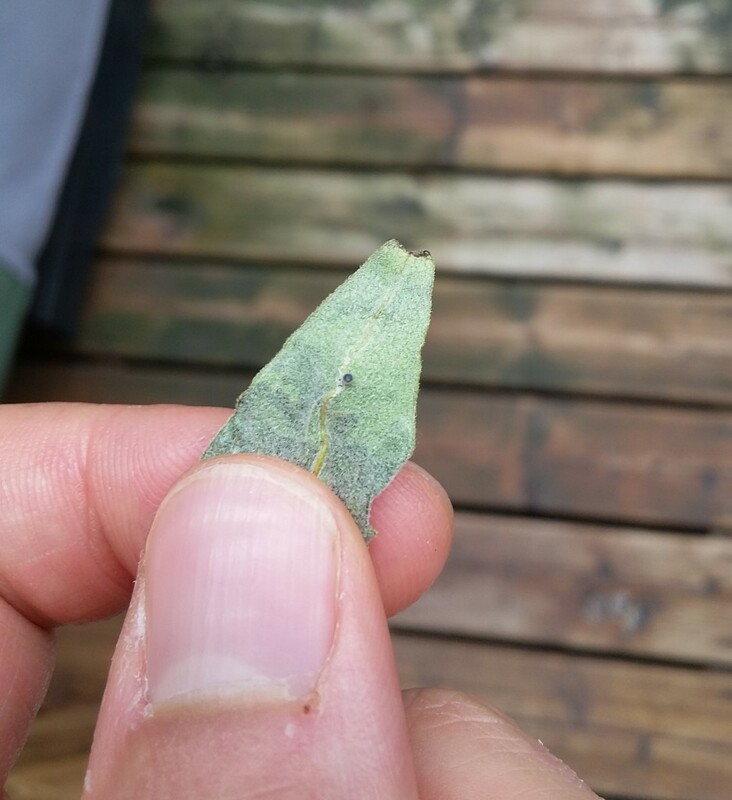 If you live in Canada or the Northern US, you can start looking for eggs or caterpillars on milkweed plants in mid-July. 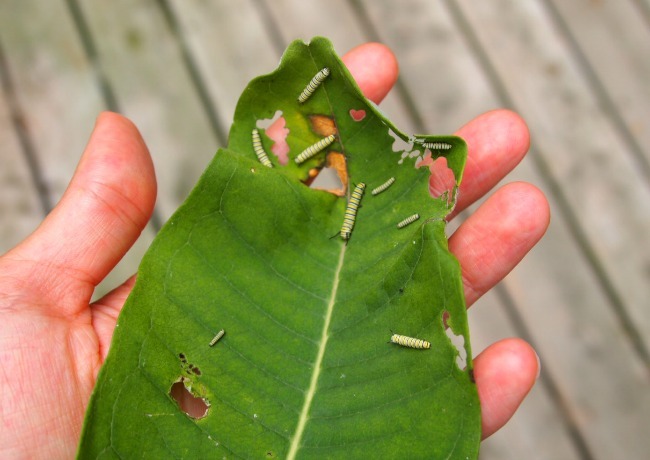 I found them surprisingly abundant and easy to find this year — almost every time I grabbed some milkweed to feed my caterpillars, I found another stowaway or two, until I was swimming in caterpillars and had to give a bunch away. 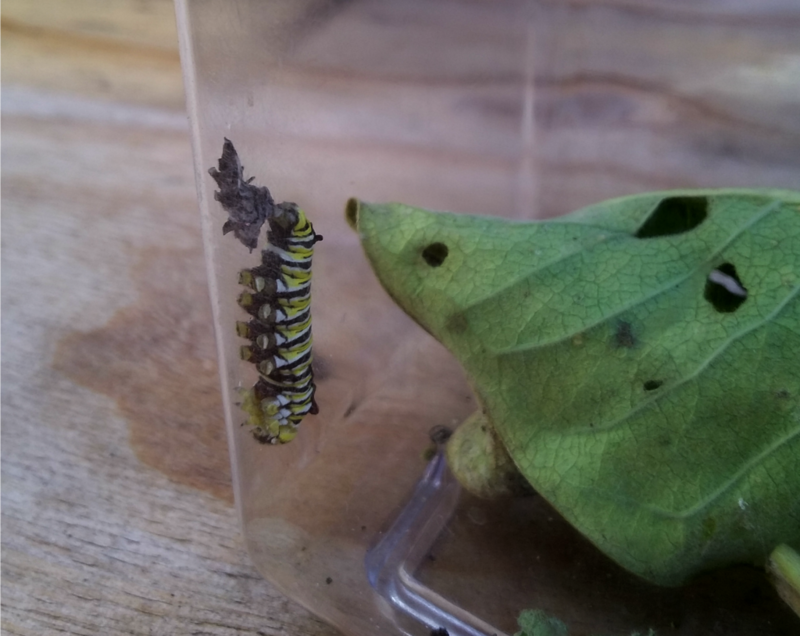 Just last night, we found a black swallowtail caterpillar, and I’m looking forward to seeing how things are different. Wow! This was so special to read and the pictures are so wonderful! This process just leaves me in complete awe of creation–how incredible! This was fascinating!! Thank you for sharing! Wow, that is like magic! Thanks so much for showing us! lives. Thank you for sharing and letting me also have a version of the same!! YES. This experience really encouraged me to slow down in ways I haven’t done in years. On two separate occasions I literally sat and waited for 20 minutes. Just sitting and staring in complete silence, not wanting to miss a second. I kept itching to get up and do something “productive,” and wanted to kick myself for “wasting time;” but I had to tell myself that sitting in awe of nature is NOT wasting time. 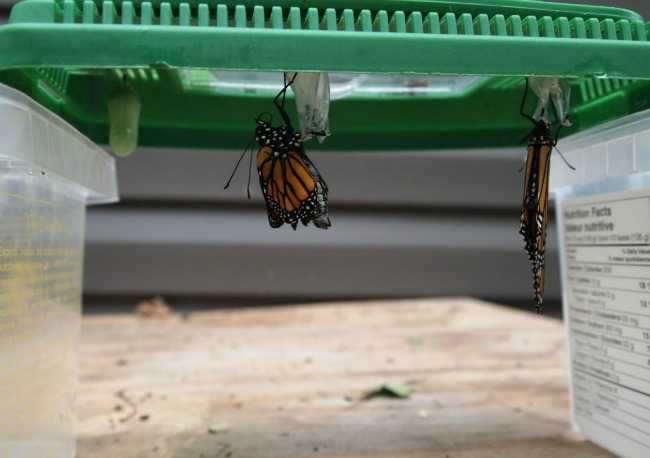 Witnessing the transformation from larva to pupa was breathtaking — it felt downright spiritual. This is so cool, love the photo’s. We have been doing this for two years now and every year it gets more exciting! We love nature and so happy you do too!